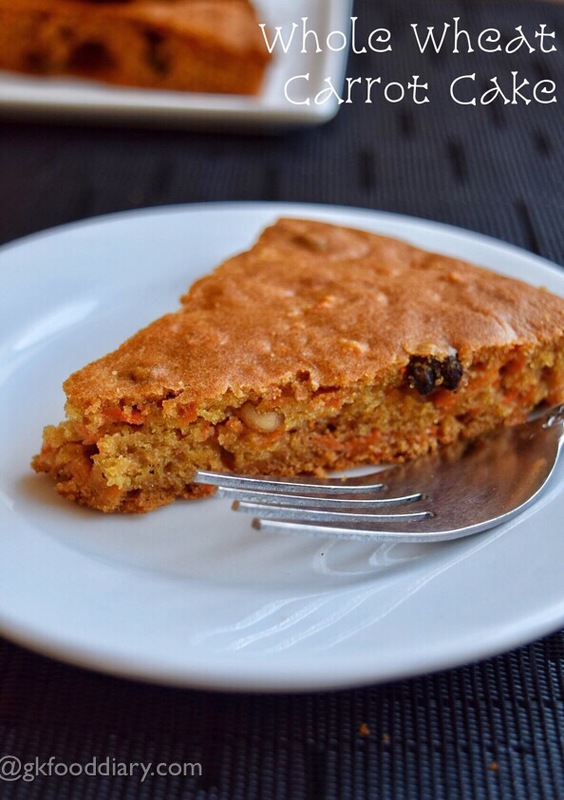 Egg-less whole wheat carrot cake Recipe – Tasty and healthy cake recipe made with whole wheat flour, grated carrots, nuts, dry fruits and no eggs! 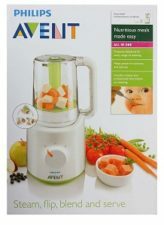 The addition of carrots, nuts gives a nice texture and unbelievably delicious taste, also provide nutrients! 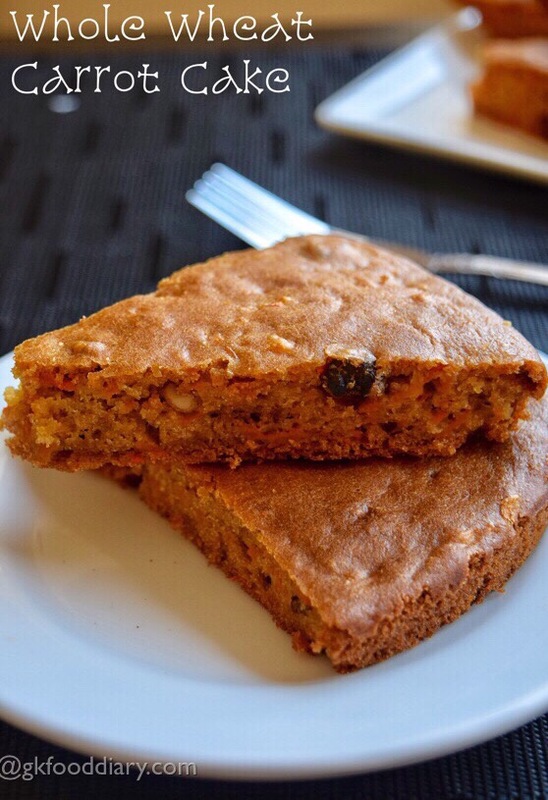 Whole wheat carrot cake is really a great healthy snack that your kid will enjoy during snack time. This can be given to toddlers after one year. Check out other healthy cake recipes for toddlers and kids. 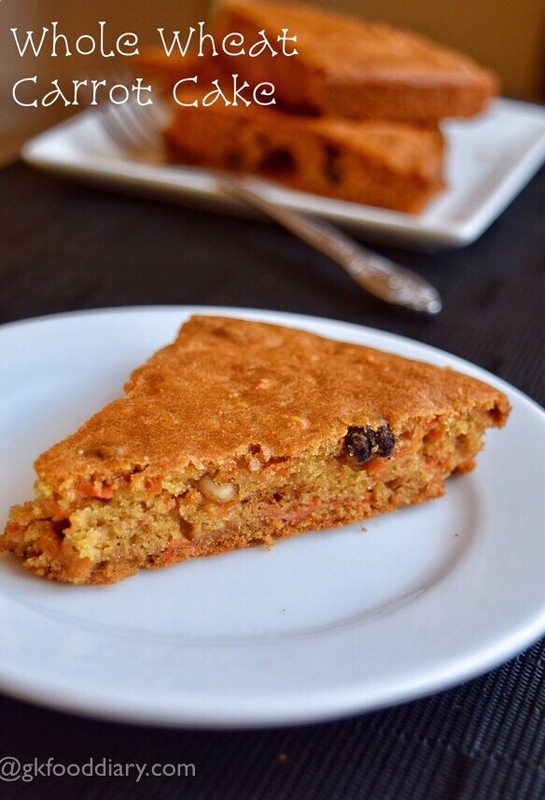 Now Let’s get on to check how to make this healthy egg-less whole wheat carrot cake. 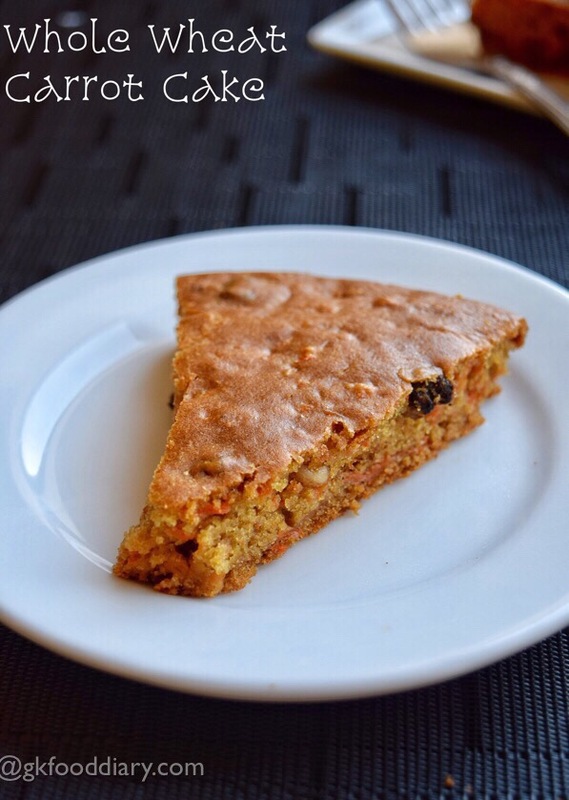 Egg less whole wheat carrot cake - no fuss, egg-less cake recipe with whole wheat flour, carrots and nuts. 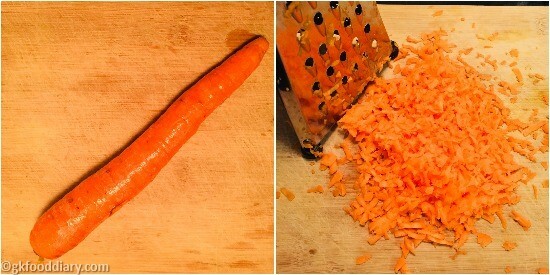 Take a carrot, wash and peel the skin. Grate them using a grater. Set aside. Take the brown sugar/palm sugar and cardamom in a blender. Grind it to a smooth powder. 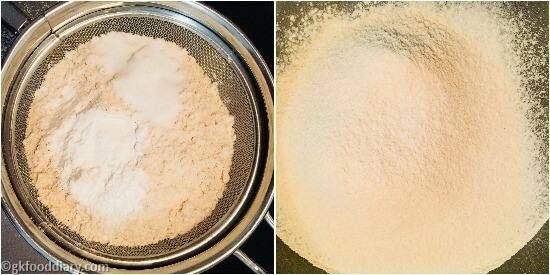 Sieve the whole wheat flour, baking powder and baking soda. Keep it ready. Also preheat the oven to 180 deg C for 10 minutes. Take broken walnuts, raisins and grated carrots in a bowl.Dust with 1 tbsp of whole wheat flour. Set this aside. Now in a mixing bowl add in the ground sugar mixture. 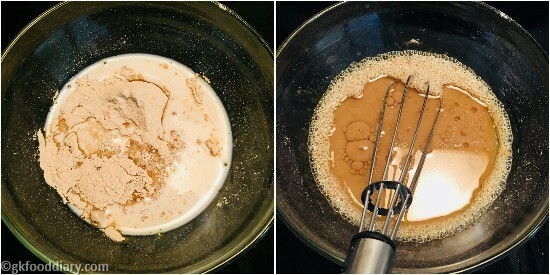 Add in 1 cup of milk followed by ¼ cup of oil. 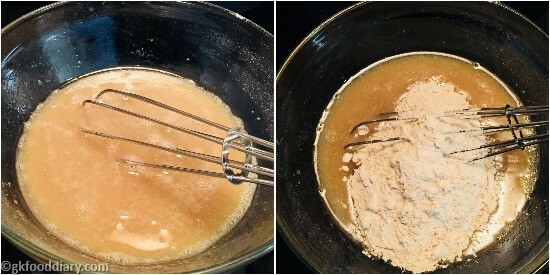 Stir it well with a hand whisk until the oil is mixed evenly. Gently fold everything well for 10-15 seconds. Don't over mix. The final mixture should be slightly thick and at pouring consistency. Adjust with milk to get the desired consistency if required. 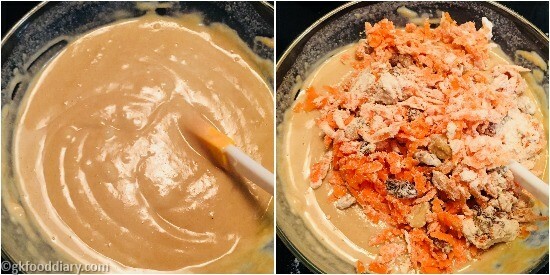 Finally add in carrot nuts mixture and give a quick mix. Grease a cake pan with oil. Pour the mixture to the cake tin and gently tape it. Bake in the preheated oven at 180 deg C for 35 -40 minutes (baking time depends on the size of the cake pan and oven) at 180° Celsius till tooth pick inserted in the center comes out clean. Allow to cool it down completely and cut into pieces! 1. Take a big carrot, wash and peel the skin. Grate them using a grater. Set aside. 2. Take the brown sugar/palm sugar and cardamom in a blender. Grind it to a smooth powder. 3. 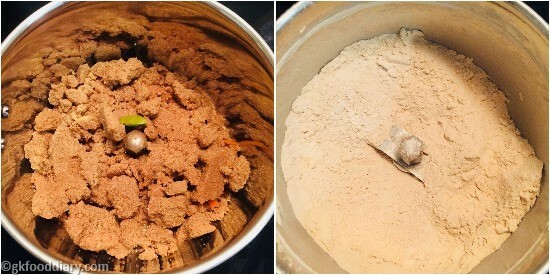 Sieve the whole wheat flour, baking powder and baking soda. Keep it ready. Also preheat the oven to 180 deg C for 10 minutes. 4. 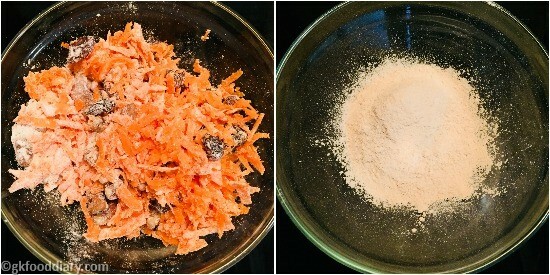 Take broken walnuts, raisins and grated carrots in a bowl.Dust with 1 tbsp of whole wheat flour. Set this aside. Now in a mixing bowl add in the ground sugar mixture. 5. Add in 1 cup of milk followed by 1/4 cup of oil. Stir it well with a hand whisk until the oil is mixed evenly. 6. Once all the wet ingredients are mixed well, add the sieved whole wheat flour mixture to the wet ingredients. 7. Gently fold everything well for 10-15 seconds. Don’t over mix. The final mixture should be slightly thick and at pouring consistency. Adjust with milk to get the desired consistency if required. 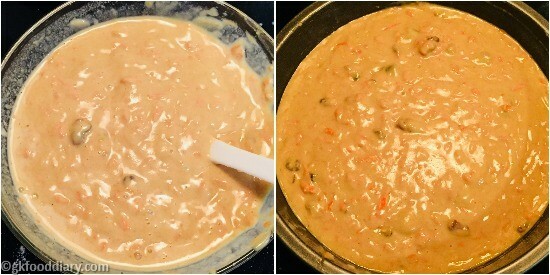 Finally add in carrot nuts mixture and give a quick mix. 8. Grease a cake pan with oil. Pour the mixture to the cake tin and gently tape it. 9. Bake in the preheated oven at 180 deg C for 35 -40 minutes (baking time depends on the size of the cake pan and oven) at 180° Celsius till tooth pick inserted in the center comes out clean. Allow to cool it down completely and cut into pieces! The delicious whole wheat carrot cake is ready to serve ! Dusting the carrots and nuts in flour helps to prevent sinking them into the cake. Dont skip that step. This carrot cake stays well for 4 days at room temperature and keeps good for a week if stored in refrigerator. Hi Mam. 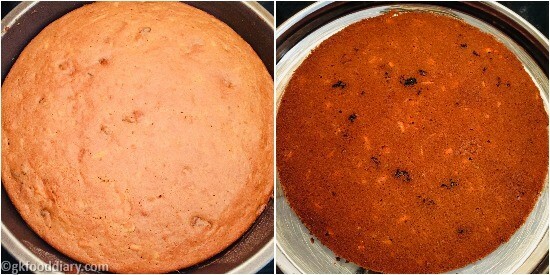 I tried this cake and followed the steps as mentioned but the cake got burnt I don’t know the reason . Can you help. 3. the baking tin is not greased well.